Real estate sales in San Miguel County finished 2018 a bit behind the record setting pace of 2017, off 13% in dollar volume and 19% in number of sales. All told the county recorded $537.5 million in sales and 499 transactions. 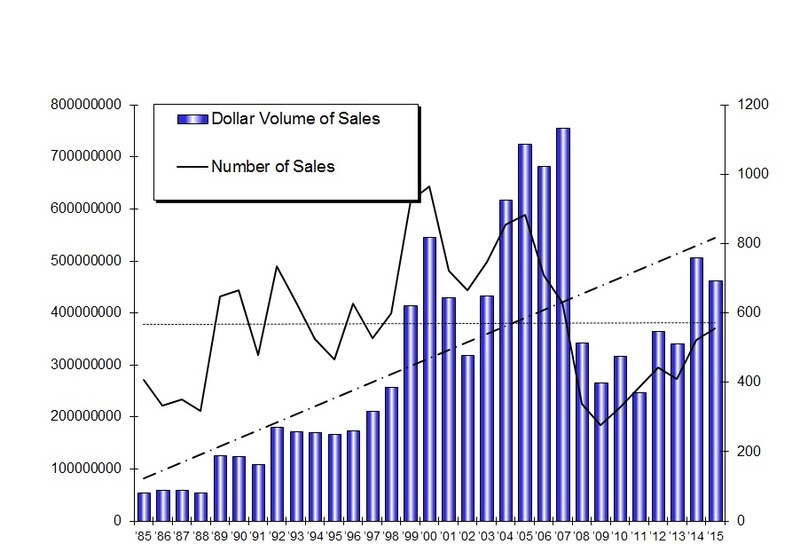 Looking back over the last 10 years this dollar volume was higher than all but 2017’s $537.5 million but the number of sales in 2018 lagged behind 2014-2017. Generally speaking 2018 saw higher prices per square foot for properties, particularly in the Town of Telluride where inventory is tight, and the decrease in numbers of sales can be partially attributed to a lack of compelling inventory. Interestingly, the single largest number of sales in 2018 was in Town of Telluride condominiums with 89 closings. Mountain Village saw 84 condominium sales. This is a bit of a change from recent years in which we have seen the highest number of sales in Mountain Village condominiums. The highest dollar volume of sales was in Mountain Village condos at $96 million while Town of Telluride condo sales accounted for $83.2 million in sales. In single family home sales Mountain Village had 24 home sales for $69 million, down from 28 for $101 million in 2017. The Town of Telluride saw 29 transactions for $87.4 million, down just one from 30 in 2017 but up almost $4.5 million in dollar volume, from just under $83 million in 2017 to $87.4 million in 2018. Finally, county wide sales were up by 9% in dollar volume but off 20% in number of sales. A lot of this was driven by some significant sales of ranch and regional properties. In 2017 real estate sales in San Miguel County set new highs in both number and dollar volume of sales over the past 10 years with $621.1 million in dollar volume and 619 total sales. The only years with greater dollar volume were 2005, 2006 and our all-time record setting year in 2007. According to Telluride Consulting overall dollar volume for San Miguel County was up 36% over 2016 and up 10% in number of sales. Dollar volume for Mountain Village was up 49% and number of sales up 5% while these statistics were up 26% and 28% respectively for the Town of Telluride. These increases were fueled by more home and condo sales with single family home sales increasing from 28 totaling $64.3M in 2016 to 30 and $83M in dollar volume in 2017. Condominiums saw similar increases going from 78 to 102 sales on dollar volumes of $71M and $86.1M respectively. Generally speaking as the market in the Town of Telluride tightened prices increased accordingly. Telluride’s real estate market had another strong year in 2016. According to Telluride Consulting, San Miguel County finished the year up 1% in number of sales and off just 2% in dollar volume from 2015. Dollar volume and number of sales in Mountain Village (for all categories of property) were up significantly at 8% and 14% respectively. Of these numbers Mountain Village condos sales were the largest segment of the market at $104.8M and up from 77 in 2015 to 96 in 2016. Interestingly in the Town of Telluride dollar volume was off 11% and number of sales off 19%. That said, single family home sales in Telluride were up from 21 in 2015 to 28 in 2106 and accounted for over $64M in dollar volume. According to Telluride Consulting, real estate sales in San Miguel County ended the year roughly even with the record breaking 2014. All told we were up 6% in number of transactions and down 9% in dollar volume from 2014 with 555 sales and $461.8 million in total dollar volume. 2014 was a big recovery year for our market, up 48% in dollar volume and 28% in number of sales from the prior year and it included the 2014 Hotel Madeline sale for $40 million, which was essentially the difference between the 2014 and 2015 dollar volume numbers. While roughly speaking the numbers were similar from 2014 to 2015 there are some strong differences in market segment performances. As selection diminished in Telluride (and particularly new inventory) we saw dollar volume of sales in Telluride drop 10% from 2014 and number of sales drop 5%. Mountain Village also slowed a bit with dollar volume down 18% but number of sales up 6%. Again, the large Madeline sale in 2014 is part of the reason for this. On the flip side dollar volume for the remaining segments of the county was up 16% and number of sales up 20%. What will happen in 2016? Time will tell. Our great snow this winter should bring plenty of visitors and we’re heading in to the two busiest months of winter. Based on activity YTD we expect that the market will continue on a similar path as in 2015. In Telluride we’re seeing a bit more inventory in single family homes, but many are remodel prospects. We’re also seeing some limited new inventory. Mountain Village may continue to offer better value as there’s more supply in most segments of this market. New construction offerings will continue to appear in Telluride with Mountain Village following as the older home and condo inventory sells out. Telluride’s real estate market rebounded in 2014, with San Miguel County finishing the year up 48% in dollar volume of sales over 2013 and up 28% in number of sales. All told 523 sales worth a total of $507.1 million led San Miguel County to its strongest year in both dollar volume and number of sales since 2007 when the local market peaked. In one of the big differences between 2013 and 2014, Mountain Village property sales were up 63% over 2013 in dollar volume and 11% in number of sales. A lot of this can be attributed to single family home sales with 27 properties trading in 2014 for a total of $90,373,666 , versus only 9 in 2013 at $27,805,586. Condominium sales in Mountain Village were actually a little behind the previous year with 61 sales totaling $60,824,300 versus 77 sales for $79,873,272 in 2013. The Town of Telluride also continued to record very strong numbers with dollar volume of property sales up 59% over 2013 and number of sales up 62%. Interestingly while single family home sales increased from 26 to 37, the increase in dollar volume was more significant and moved from $49,931,410 to $75,369,864. Condominium sales were even stronger, increasing from 52 to 95 on dollar volumes of $43,888,199 and $85,329,754 respectively. In the remainder of San Miguel County dollar volume was up by 8% from 2013 and the number of sales were up 17%. What does this mean for 2015? Based on activity YTD we expect that the market will continue to remain strong with inventory in Telluride tightening even more. Mountain Village may continue to offer better value as there’s more supply in most segments of this market and the days of the bank sales and REO offerings are, for the most part, behind us. New construction offerings will again start to appear in Telluride with Mountain Village following as the older home and condo inventory sells out. The graph above is from data taken from county records and represents all sales in the county in each given year, not just Multiple Listing transactions, and was created by Telluride Consulting, a local firm that has tracked real estate sales in San Miguel County since 1985.